In addition to improved seam quality and increased productivity, the APW-297 and APW-298 also delivers dramatic improvements in basic performance such as better maintainability, reduction in thread length after thread trimming, and the adoption of a needle-feed type machine head and direct-drive machine-activating method. 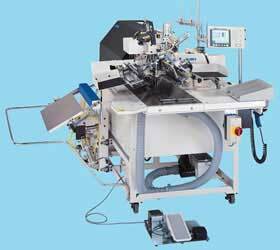 Newly developed welting patch cutting device and automatic flap/ pocket bag feeder are now optionally available. These components work to upgrade seam quality and further increase productivity over all processes, including the after-process. *The same optional parts are offered for the APW-297 and APW-298. Since optional parts can't be retrofitted to the machine after purchase, be sure to specify any that you may need when placing your order. The knife is motor-driven. To cut the welting patch as short as possible, it automatically adjusts itself to the sewing length established on the operation panel. This enables more consistent welting patch feed and folding operations. The welting patch cutting knife is located under the welting patch table. This keeps the knife from damaging the garment body. In addition, the knife can be changed with ease. 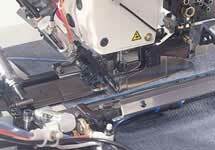 Welting patch cutting, a job conventionally done by hand in the after-process, is no longer required.  The result is a substantial reduction in the processing time. The clamp exclusively used during welting patches cutting allows the cutting device to cut welting patches even when the binder is in the lower position. This further eliminates wasted time due to welting patch cutting. 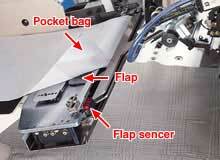 The device works to sew the flap and pocket bag at the same time with the pocket bag placed on the flap. Simultaneous sewing of a flap and pocket bag produces beautifully finished welts free from uneven material feed. In addition, there's no longer any need to attach the pocket bag on the flap side, a task normally required in the after process. The fulcrum at the center of the automatic flap feeder claw clamps flaps securely and automatically feeds them to the sewing position. This promises increased productivity. The length of thread remaining after thread trimming is further reduced to eliminate thread picking. The length of thread remaining at the beginning and end of the seam has been shortened to 15 mm for needle thread and 22 mm for bobbin thread. Thread picking to streamline the after process is no longer required. The shortened remaining length of thread can reduce bobbin thread waste, increase the number of welts sewn per bobbin, and reduce the frequency of bobbin thread changing. When running at its maximum sewing speed of 3,000 rpm, the machine increases the traveling speed of the clamp foot and promises an extremely rapid response time at startup and stop. This explains the machine's unrivalled production speeds among automatic welting machines. The operator can set the next welting patch, flap (with the automatic flap feeder), and garment to be sewn while still sewing those currently set. This shortens the cycle time and increases productivity. Needle-feed system using a stepping motor. 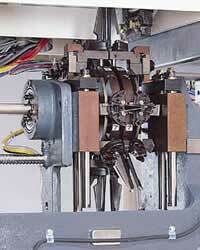 The needle-feed completely synchronizes with the clamp foot travel. This reduces resistance between the clamp foot and material, thereby improving seam quality. The operator can set the length of needle-feed and the ON-OFF condition of the needle-feed system on the operation panel. As a result, the machine can quickly respond to a wide variety of materials and sewing conditions. 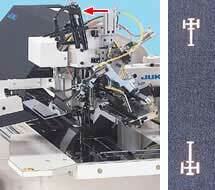 The operator can also establish the needle-feed length for reverse feed sew-ing individually on the operation panel. The front binder goes up during sewing. This upgrades productivity by allowing the operator to easily set the next garment to be sewn while the machine is still sewing the current one. The binder comes straight down after clamping a welting patch. This prevents the welting patches from sagging due to air resistance, thereby improving the consistency of welting patch feed. 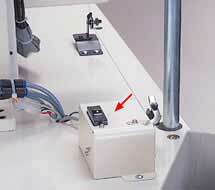 In addition, the operator has a wider view around the sewing area when the binder is in the upper position. The folding plate folds the welting patch and presses it down. can flexibly respond to changes in material thickness. The folding plate clamps welting patches securely and prevents slippage of welting patches made of slippery material. 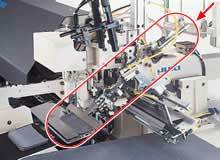 To ensure consistent welting patch feed, the automatic welting patch feeder securely clamps welting patches made of soft materials or without interlining cloth. 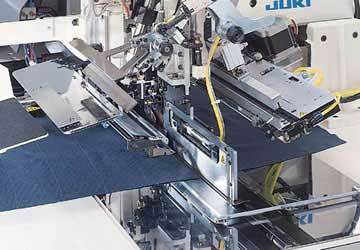 With the automatic welting patch feeder, the operator can set the next welting patch to be sewn while the machine is still sewing the current welt. Large-size operation panel with improved capabilities. 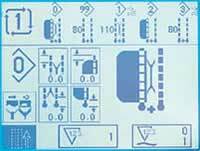 The panel is an interactive type that uses large icons for easy operation. given in characters. The messages clearly inform the operator of the appropriate corrective action. As many as 100 different patterns can be stored in memory and 10 different cycle sewing programs can be established. As many as 100 different sewing patterns can be stored in memory, each with its own settings for sewing length, operation of the knife, operation of the stacker, and other sewing conditions. In addition, new patterns can be created quickly using the copy function. For cycle sewing, as many as 10 different programs can be registered. As many as 5 different sewing patterns can be programmed in combination in each program. The direct drive method is adopted to drive the machine. The direct drive reduces machine time by instantly responding to machine startup and stop commands from the operator. The direct drive uses no belt. 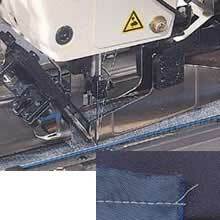 This eliminates sewing troubles caused by the belt such as contamination of the material and thread entanglement. The direct drive reduces noise and vibration during operation to create a more comfortable work environment. APW-298 for slanted pocket with flap. The function to separately drive the needle bars allows flexible setting of the welt angle, - a key advantage in the sewing of various kinds of pocket shapes such as slant pockets and welt pockets. 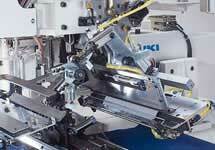 The machine is equipped as standard with JUKI's unique seven-set turret-type corner knife. By responding to various sewing conditions such as slanted sewing angles, different sets of corner knives can be used separately to produce welts with increased accuracy. The lamp makes it easier to set a garment body on the machine. Moreover, the positioning of the garment body no longer has to be marked. Bobbin thread remaining amount detecting device. The detecting device warns the operator to replace the bobbin thread before it runs out. This prevents sewing troubles such as re-sewing. Since the bobbin thread winder is driven by an external motor mounted outside the sewing machine, the bobbin thread can be quickly wound while the machine is at rest. 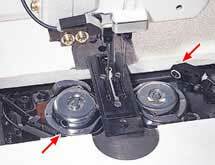 This improves the workability of bobbin thread changing.